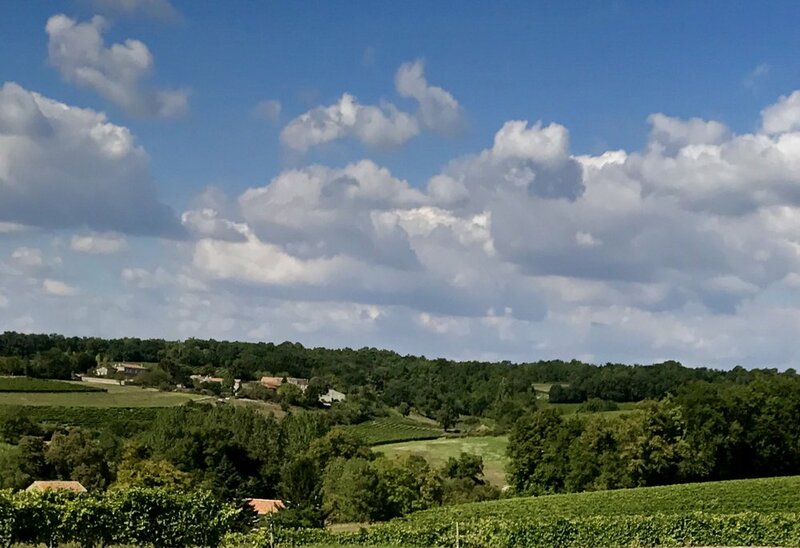 A tip for anyone visiting wineries in France or anywhere else: The people in the tasting rooms, whether the winemaker or anyone else, don't want to talk exclusively about their wines. One potential topic of conversation is other wineries you have visited or are planning to visit. People in the wine trade, like anyone else, love to talk about their neighbors! During Nicole and I's visit to Chateau du Tailhus on Bordeaux's Right Bank a few weeks back, Nicole mentioned to our host that we planned to visit Cognac the following week and asked for any recommendations. Our tour leader told us we had to visit Bourgoin Cognac. So we did! This small producer, located in the middle of the Cognac region an hour and a half drive north from Bordeaux, turned out to be exactly what we were hoping for. 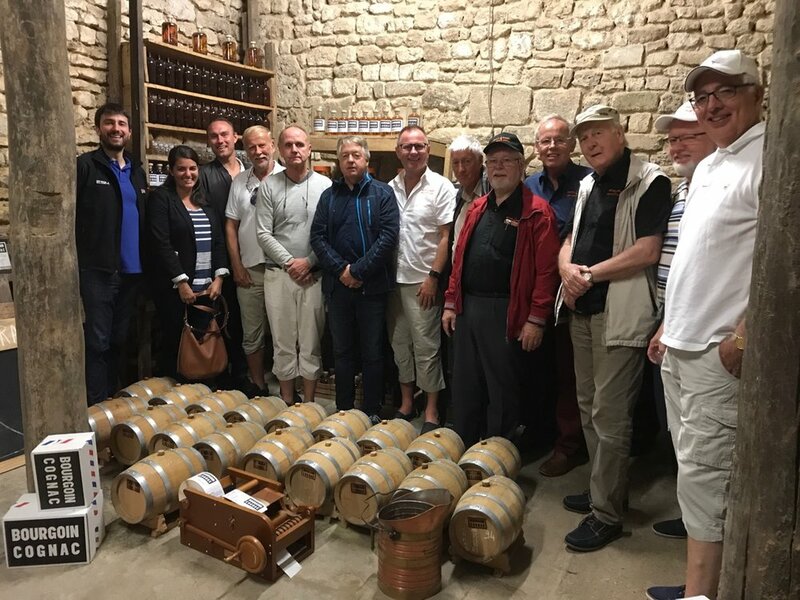 Although the Cognac market is dominated by a handful of large producers -- think Hennessey, Courvoisier, Remy Martin, and Martell -- we hoped to skip the large cookie cutter tours and check out an independent producer. Bourgoin turned out to be just that. Upon arriving a few minutes after our reservation time (we nearly ran out of gas in our car on the way to the distillery, another story for another time! ), we walked in on a tour just getting underway. The distiller greeted us, asked if we spoke English (we do, indeed it's our specialty!) and we were off. The tour turned out to be comprised of Nicole, myself, and a Cognac tasting club made up of Dutch friends who, at least at one point, all worked for the same bus company in the Netherlands. Once a year, they head south to France to visit a few Cognac distilleries. A jolly crew. Frédéric Bourgoin, the distiller and our tour leader, is a great example of what can make small, family run businesses cool. At one point, he allowed Nicole and I to taste a 1979 pineau originally put into barrels by his grandmother. Beyond that, we were particularly impressed with Bourgoin's "microbarrique" cognac from the 1994 vintage. Frédéric has been experimenting with using "micro" barrels (shown in the picture above), to finish cognacs aged for years in larger barrels in order to impart additional barrel characteristics at the end of the aging process. He wouldn't even divulge how long the cognac spent in the microbarrels claiming it as a trade secret. But the result is delicious, similar to single malt scotch. Overall, Nicole and I loved spending a day touring Cognac. It's a great day trip for anyone visiting Bordeaux. As shown in the pictures above, the countryside is beautiful with rolling hills and hearty vineyards. 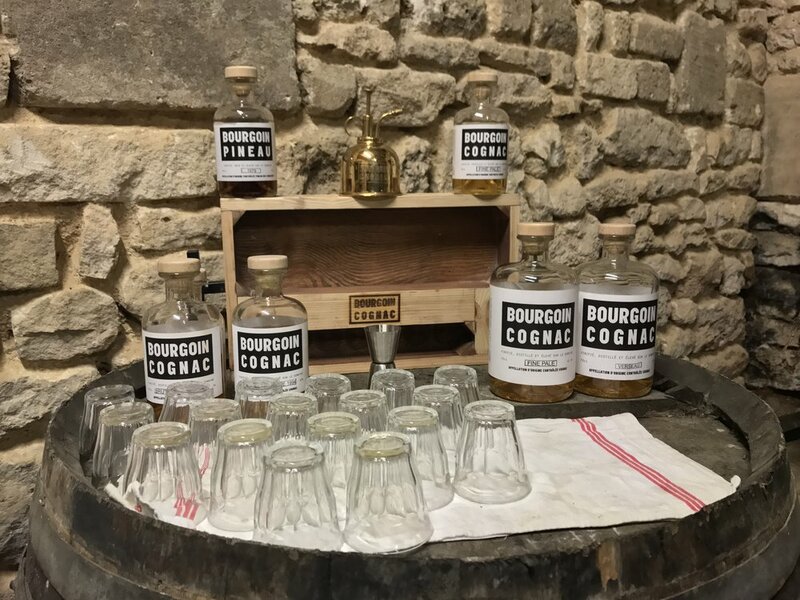 And after getting the chance to visit the Bourgoin distillery, we will never look at cognac the same again. Like this post? Want to read more about Travis and Nicole's travel adventures? Check out Merlot Mania! Touring And Tasting In Pomerol And Saint Emilion On Bordeaux's Right Bank.